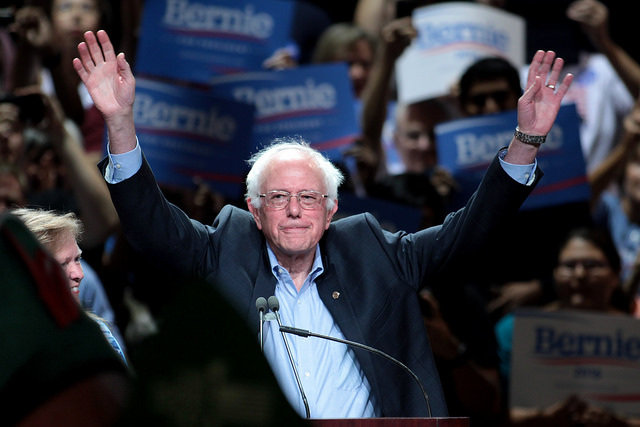 Will Bernie Sanders be our First Yogic President? I have lived in this country 11 years, and one of my proudest moments will soon come true—I will be a U.S. citizen in three months, and I am looking forward to voting for Bernie Sanders. I found this to be very powerful and was very moved by his words. Bernie is essentially articulating the fundamental tenets of yoga, which equate to “unity consciousness.” From what I have heard so far, he is the only presidential candidate who has such a broad and all-inclusive view of religion. When we are in touch with this single stream of consciousness all around us, we feel a sense of oneness, empathy and sympathy for others—and a sense of wanting to take care of others. In every speech of Bernie Sanders, one can feel his connection for this oneness and his longing to take care of people. This single stream of consciousness doesn’t always seem singular, because we project forms, shapes and colors onto this singularity, so that we can relate to it better. These projects are often based on one’s spirituality and religiosity. Each religion then becomes a window to a larger universal consciousness. So when a person runs for the job of the U.S. president—who is responsible for such a diverse community—having any religious background limits their understanding of humanity. Their one window (religion) becomes a liability. Only when one jumps out of the window, will one transcend the myopic view of religion and understand a universal consciousness. It seems to me that Bernie jumped out of this window half a century ago, when he marched in the civil rights movement. He jumped out of many windows when he started fighting for the poor, regardless of their skin color and religious background. With every jump, he is peeling away the layers that separate us and supposedly “protect” us from other humans. This is exactly what yoga does to us. Yoga teaches us to break the barriers and mental constructs we create, between ourselves and world in which we live. Another important concept of yoga is how we define nature. In the yogic paradigm, everything that has ever been created is nature, it’s not limited to flora and fauna. We humans, planet earth and other spatial bodies are part of nature too. Nature is one large living entity, of which we are a small part. Yet another way of looking at this words as a singular consciousness. When we hurt one aspect of this nature, another part suffers. Unless all aspects of nature are in harmony, an individual part of nature cannot be in total harmony. Bernie understands this interconnection and has made many choices to keep balance in nature. For example, he has fought vehemently in regards to climate change issues. He’s voted against wars. So, what is the big deal about Bernie embodying yoga philosophies? Well, in his words, it is “huuuuuuge.” Being a yogi makes for being a better leader. Being a yogi make one an inclusive person, while being tolerant of our differences. Being a yogi hones one’s moral compass, thereby doing things that are good for a larger group of people. Being yogi puts people on the pursuit of truth. They become fearless in seeking and living the truth. Being a yogi means choosing nonviolence over violence, with violence always being the last resort. As a yoga teacher and practitioner, it gives me comfort to know that a presidential candidate believes in this unity consciousness. Bernie feels the pain of all of us, and not just that of a subset of the people that share his belief systems. A person who feels pain of all, will most certainly fight for us all. Judging by his belief systems and lifestyle, I find Bernie Sanders to be a living yoga master. Yoga is science of self realization and self manifestation. It has a physical, mental, philosophical and spiritual component. Just doing the physical practices (asanas) doesn’t make one a yogi. It is living the yoga philosophy and yogic lifestyle that makes one a yogi. Bernie is doing precisely that—he is embodying the principles of yoga. I truly feel that Bernie Sanders represents the values of most of the over 30 million people who practice some form of yoga in the U.S. While I cannot influence all yogis to vote for him, I encourage my fellow yogis to study Bernie’s philosophies from a yogic perspective. I assure you that you will find a yoga warrior in him—one who stands for and fights for a life lived through yogic values. 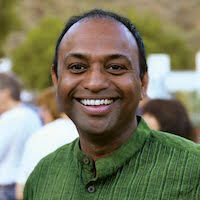 Yogi Arvind Chittumalla is a spiritual teacher, entrepreneur and activist from Los Angeles. He teaches and speaks on Raja Yoga, Samkhya, Vedanta and Shaivism. He is the founder of Yoga Next, a non-profit dedicated to raising the standards of yoga education in the us. He also produced and directed a yoga documentary by the name Yoga Maya. Connect with him on Facebook.